The FDC Office of Women's Health collaborates with other government agencies and private organizations to help increase Hispanic women's access to FDA health and safety information. 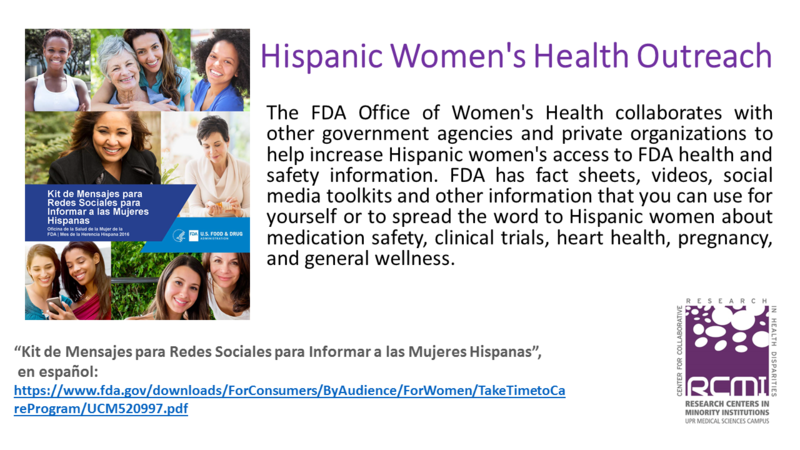 FDA has fact sheets, videos, social media toolkits and other information that you can use for yourself or to spread the word to Hispanic women about medication safety, clinical trial, heart health, pregnancy and general wellness. Website design, management and hosting by RCMI-IIS: Integrated Informatics Services. This project is supported by RCMI grant U54 MD007600 (National Institute on Minority Health and Health Disparities) from the National Institutes of Health. The content of this website is solely the responsibility of the authors and does not necessarily represent the official views of the National Institutes of Health.